I came up with the idea of this post and to explain how to use the String Starters digital and rubber stamp line I created earlier this year for the craft industry. String Starters were created to assist my students with time-saving and pattern making techniques. The digitally created pattern “base” is used to start the pattern. One of the foundational techniques used when creating a Zentangle involves drawing a “string” – an impulsive line that creates the boundary, or area in which you draw (or “tangle”) your patterns. String’s are not absolute. You just use them as a guide and then “go for it” with your pen. 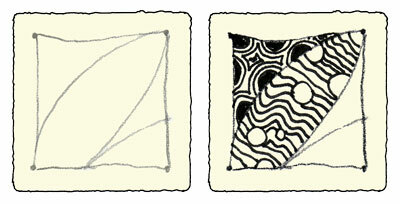 LEFT: A String is lightly drawn on an official Zentangle tile. RIGHT: Patterns drawn within the String with a Sakura Pigma Micron pen. String Starters are not, technically a string, they are helpers that start the patterns you tangle within a string. There are 12 sets of patterns in the String Starters stamp line. String Starters, It’s only the BeginningTM of your Zentangle inspired art because you can go in so many different, creative directions using them. I am using words associated with the Zentangle drawing technique as a SEO strategy because Zentangle is a VERY popular art form and a buzz word in the craft industry. I will promote my post on Facebook, the StringStarters.com site and through my email marketing list (Constant Contact) AFTER I migrate this blog site to my established domain http://www.angievangalis.com – since this blog is a subdomain off WordPress.com url.